We are extremely proud to announce that last night Richmond Chambers LLP was declared winner of the &apos;Best-Emerging Firm&apos; category at the 12th annual Managing Partners&apos; Forum Awards for Management Excellence 2014. The Awards are an integral part of the MPF International Management Excellence Summit, in association with Harvard Business Review, Financial Times and Google. Richmond Chambers LLP was selected for the award on account of its outstanding contribution to disruptive change within the legal services market. "As a business they have laid the foundations of an emerging new force in the immigration field. Not just for clients but also qualified legal personnel who want something different. The achievement of transforming a traditional barrister&apos;s chambers model into a corporartised entity with direct client access was also a stand out feature of their submssion." 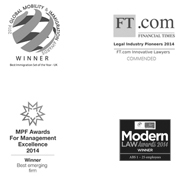 The award represents the first time that the MPF has made an award to a barristers&apos; chambers in any category in the 12 year history of the awards. Other short-listed firms were 39 Essex Street, Fondia, Keystone Law, Obelisk Legal Support, Riverview Law, Schillings and Slater & Gordon.